Managing a Dangerous Goods shipping operation is a lot like running a farm. It may seem like all you do is spend money, while the potential profits are hard to imagine—and a long way off. But if a farmer makes every decision with that long term in mind, the operation is much more likely to turn a profit. How do you manage a hazmat operation like a profitable, well-run farm? By using higher-level compliance to make long-term, brand-building, revenue-enhancing decisions—transforming Dangerous Goods compliance from a cost center into a profit center. Our free Total Value of Compliance Assessment has three parts, and part 3 is all about the revenue opportunities of higher-level compliance. TheTotal Value of Compliance Assessment helps you and your Labelmaster account executive evaluate and improve your organization’s TVC. And the higher your TVC, the more profitable your operation can be. A decade ago, the policy of supply chain giant CEVA Logistics was to refuse hazmat. Today, hazmat contributes millions in monthly revenue, with the company handling more than 700,000 shipments a year in the U.S. alone. Global DG/HSE Specialist Rusty McMains credits his “deep and intimate understanding of the direct financial costs and impacts” with allowing this transformation to take place. How could a “deep understanding” of hazmat’s impact grow your company’s revenues? When you’re confident in your hazmat compliance, you can introduce popular products that other companies may avoid. Your product development teams can design new products aligned with regulatory standards from day one, opening worldwide markets at lower shipping costs. Your reputation for Dangerous Goods compliance can make your organization a more attractive partner for joint ventures and other collaborative initiatives. In our most recent Global Dangerous Goods Confidence Outlook, 23% of hazmat pros surveyed said their companies viewed compliance as a competitive advantage. How can compliance be a competitive advantage for you? Since compliance gaps can lead to shipments being delayed, operations with superior compliance typically have far fewer shipments delayed and a higher on-time delivery rate. 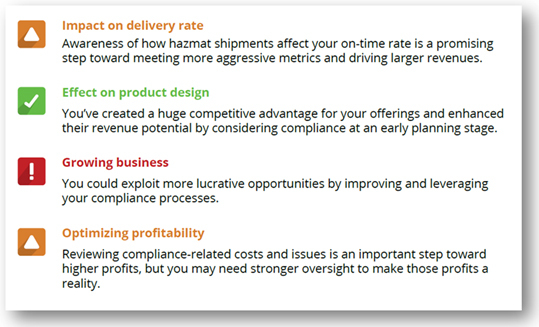 Now, say superior compliance helps your company achieve a 99% on-time delivery rate. A competitor might consider 95% pretty good, but compared to you, they’re dropping the ball once every 25 deliveries. That’s just one way your compliance advantage can raise you above the competition and make you a more valuable supply chain partner. 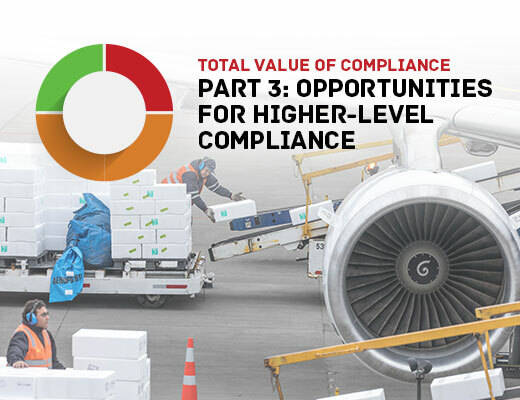 Part 3 of the Total Value of Compliance Assessment asks the questions that will help you achieve superior Dangerous Goods compliance. These aren’t yes-or-no questions—they’re open-ended conversation starters that reveal weaknesses you didn’t know you had and opportunities you may never have considered. The conversation will probably take about 30 minutes. These results are more than simply information you can use to improve your TVC. They can be the ammunition you need to persuade your management that improved compliance is worth pursuing. Don’t wait to explore these questions—take a free TVC Assessment today! To schedule your assessment, call your account manager or contact Labelmaster Marketing Manager TJ Harvey.